Looking for a car audio system that will be heard from 1/2 mile away??? Well, you've come to the right place. 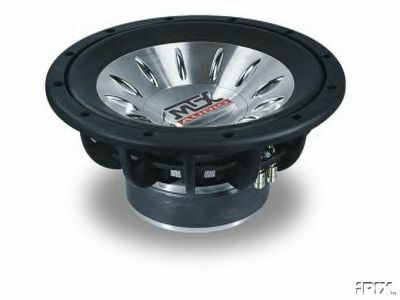 MTX's competition-level Thunder8000 12" subwoofer is a showcase of high performance and dynamic sound. 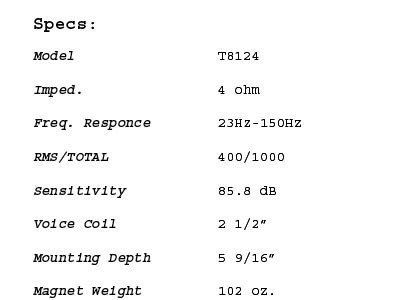 The strontium ferrite magnet alone weighs in at a mighty 102 ounces (6.37 lbs.)! This heavyweight unloads some of the biggest bass that MTX has to offer. A four-layer 2-1/2" voice coil keeps this sub nice and cool, even when the music is raging. Spider plateau venting — small vents around the frames — also helps dissipate hot air and curb distortion. Need an amp to go with your subs? This amp will be more than enough power for your system. 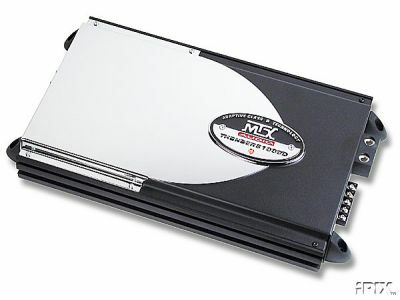 If you're really serious about your bass, check out the MTX Thunder81000D mono subwoofer amplifier. MTX uses its ultra-efficient Adaptive Class D amp technology to get 1500 watts of kickin' power out of a relatively small package. The built-in compression circuit irons out voltage peaks so you can push this amp hard without damaging your subs. The Thunder81000D is loaded with the best of MTX's innovative technology, including super-fast MOSFET power supplies, low-impedance/high-power transformers (which produce less heat for more reliable performance), and a variable low-pass crossover with a sharp 24 dB per octave slope. Add Thunder EQ bass boost and an EBC2 port (which allows control of multiple Thunder EQ-equipped amps with one EBC remote), and you'll have the biggest, baddest bass output machine around! NOTE: PRICES DO NOT INCLUDE SHIPPING AND HANDLING. THERE IS NO SALES TAX.